Free Shipping Included! 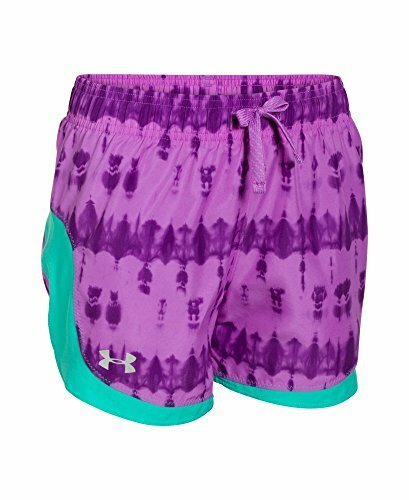 Under Armour Girls' UA Stunner Novelty Shorts XL (18-20 Big Kids) EXOTIC BLOOM by Under Armour at Ultra Fitness Tech. MPN: 1250288-568. Hurry! Limited time offer. Offer valid only while supplies last. Look good and feel even better when you workout wearing UA's Solid Stunner Shorts. Lightweight woven fabric delivers superior comfort and durability. Look good and feel even better when you workout wearing UA's Solid Stunner Shorts. Lightweight woven fabric delivers superior comfort and durability. Signature Moisture Transport System wicks sweat to keep you dry and light. Covered elastic waistband with external drawcords. Streamlined scalloped hem unlocks range of motion. Color blocked side panels. Reflective logo offers extra safety during low-light. Allover print or emboss. Loose fit. HeatGear is best for weather between 75 and 100 degrees. 100% polyester. Imported.